- This article was amended on 3 August 2015; please see final paragraph. The British Association for Adoption and Fostering, which helped find substitute families for children, has closed and transferred some of its functions to other charities, with the loss of 51 jobs. The BAAF announced the move on Friday, saying "significant changes and economic conditions" had made it impossible to sustain the organisation. In England the Coram Group, a larger charity that helps children with a wide range of challenges, has pledged to take on a number of BAAF’s functions. In Scotland the government has transferred the work of Scotland’s Adoption Register and funded a national adopter information helpline for Scotland at St Andrew’s Children’s Society. BAAF Northern Ireland and BAAF Wales will continue to operate on a limited basis for a brief period to allow consideration of options to transfer some services and staff to an alternative provider. A total of 55 of BAAF’s 134 staff have transferred to Coram, but 51 have been made redundant, according to a Coram spokeswoman. The remaining 28 have been retained for the time being, she said. The BAAF’s latest finances show it generated total income of £8.7m, including a government grant of £1m, in the year to 31 March 2014. It spent £9m that year, more than its income, but the previous year it spent only £7.9m against an income of £9m. But the association’s total net liabilities, including pensions, grew from £731,000 in the year to 31 March 2013 to £2.3m in the year to 31 March 2014. The financial pressures on the BAAF included "the loss of funding, high infrastructure costs and historic liabilities", as well as a decrease in referrals to its adoption service Be My Parent, according to the Coram spokeswoman. She said: "It was not possible to make the organisation financially viable within a realistic timeframe." 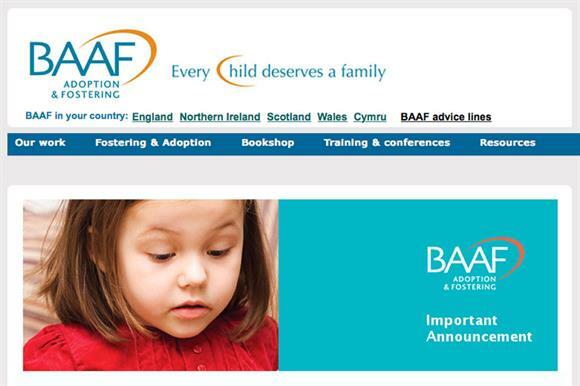 BAAF and Coram have announced the creation of a new entity called CoramBAAF Adoption & Fostering Academy. No BAAF trustees will transfer to this entity or to Coram, according to the Coram spokeswoman. CoramBAAF will continue BAAF’s role as an independent membership organisation for agencies and individuals in the UK. It will also continue the following BAAF functions: research; policy and development; membership administration; professional advice and professional development; National Adoption Week; and the Adoption Activity Days. Two other former BAAF functions, the National Adoption Register for England and the Independent Review Mechanism (England), will be run independently by First4Adoption and Coram Children’s Legal Centre respectively. The BAAF magazine Be My Parent has also been closed. Carol Homden, chief executive of Coram Group, said in a statement: "The CoramBAAF Adoption & Fostering Academy is a sustainable way forward that enables the expertise of two organisations renowned for their work with looked-after children to be shared to create better chances for children." BAAF chief executive, Caroline Selkirk, said in a statement: "We appreciate that this is a very challenging time for our dedicated staff and are committed to giving them as much support as is possible during this period." BAAF is not the first charity to join the Coram group, which has expanded through formal partnerships with Life Education in 2009, the Children’s Legal Centre in 2011, and Voice in 2013. - Based on information provided by Coram, the article originally said that CoramBAAF would run the National Adoption Register for England and the Independent Review Mechanism (England).